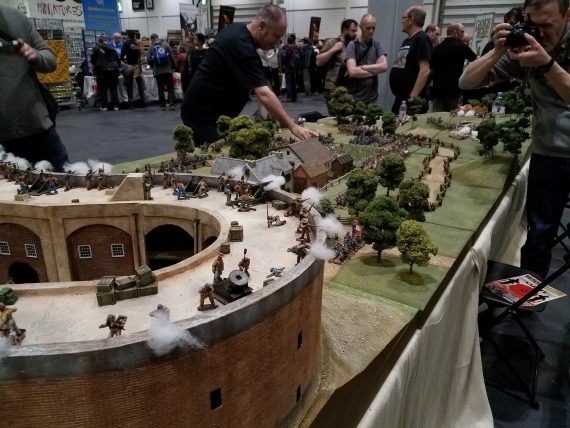 Salute is one of the largest wargaming conventions in Europe and very different from anything held in America. I was able to go last year and decided to go again this year. Unlike most US conventions, Salute is only for one day so it's very important to have a plan. Last year I wandered around in a daze for most of the event picking up random things. This time I knew what vendors I wanted to speak with and figured I'd spot cool tables along the way. 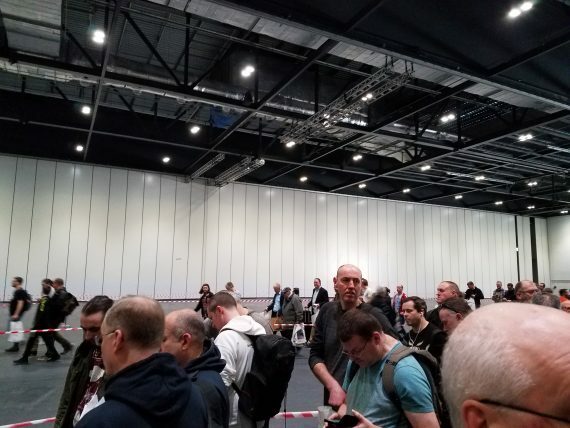 After they opened the gates and let the huddled masses free I headed straight for the Magister Militum booth. They stock a lot of small scale miniatures, from 3mm all the way up to 28mm. I got some 3mm packs for my friends over at PicoArmor for them to play with. After that I started wandering. The hall is maybe a third the size of Gencon's dealer hall, but it also has gaming stands setup in the aisles. 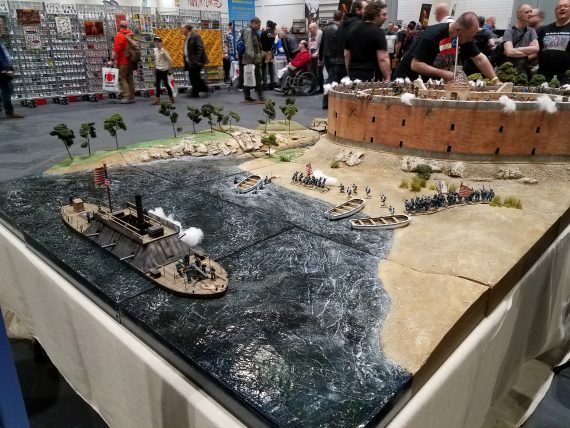 Lots of clubs from all over Britain spend the year designing, testing, and building beautiful gaming experiences just to show off at Salute. It's loads of fun to see what they come up with. I picked up a few things at Salute. Space and weight are always at a premium when traveling back home, so I didn't go too crazy. I got some spaceships from Brigade Miniatures, some new Dropfleet ships at TTCombat, and a ton of turrets that just happen to fit a GW Predator tank from Bitspludo. The swag bag is not nearly as stuffed as the Adepticon bag, but they commission a special miniature every year. This time it's a trio of First World War soldiers sharing some alcoholic refreshments after the war ends. The is the 100th anniversary of the cease-fire and there were a few WW1 tables set up. Overall Salute is a fun convention to visit. 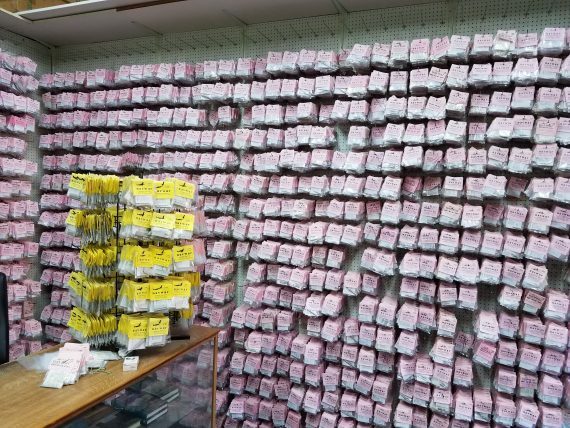 There are lots of small dealers here that you wouldn't even know existed if you just focused on US conventions. And the tables are amazing. However is it quite crowded and the locals have no problems with jamming 50 people into a space meant for 5, so expect to feel crushed at times. I didn't get as many second glances with my American accent as I did last year, but I didn't hear any of my fellow countrymen either. But if you get the chance to go, I strongly recommend it. Now that Salute is done I plan on visiting more cool places over the next few days. Portsmouth and Nottingham are definitely on that list so maybe a few more blog posts are in my future? Sounds like a great time. No surprise you ended up at NavWar. However I’m kind of surprised you don’t already have Brazilian and Argentinian WW1 fleets! You’ve got a few months to get your Brazilian navy ready for an 100th anniversary game of their entry into WWI. I look forward to seeing them.